I know I keep saying so, but I may have found my new favorite neighborhood in San Diego County - Ocean Beach. Oh my gosh, the antiquing the ANTIQUING! Tim and I spent hours in Newport Avenue Antique Center and I desperately tried to be frugal. I ended up with one purchase for myself - a brass duck bowl. Very pretty right? Only $12. You would not believe the brass animal menagerie they had there. I had to practice so much self restraint... My plan is to plant some succulents in my little ducky but I'll need to buy a few more succulents first, oh darn. 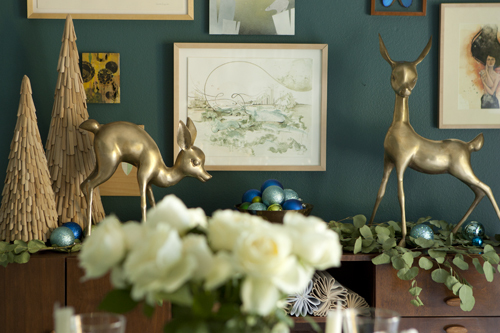 For an example of the bounty, did you see these pretty deer from Emily Henderson's holiday special? Tim and I ended up staying until the store closed and still had more to look at. I have a feeling we'll be back soon!